The Lost Wine Cellar of Notre Dame? I make no effort to hide my enthusiasm for Washington State Cabernet Franc. As I noted in my Walla Walla musings, Washington Cabernet Francs have the structure and depth of our best Cabernet Sauvignon and Merlot wines but with an intoxicatingly gorgeous bouquet that can range from perfumed and floral to savory fresh forest floor and coffee nuances. It truly is a grape variety that every Washington wine lover should explore. For wine drinkers outside the state, these wines may be hard to come by but they are worth the hunt. Simply put, if you see a Washington Cab Franc on a restaurant list or wine shop shelf, try it! 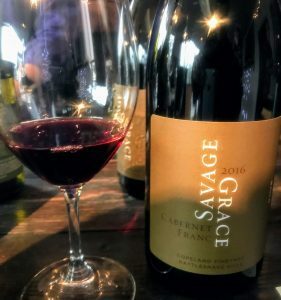 I suspect that Michael Savage of Savage Grace Wines shares a similar love affair for Cabernet Franc because he makes two fantastic examples of the variety–one from Two Blondes Vineyard and the other from Copeland Vineyard in the Rattlesnake Hills. He also makes a Cabernet Franc rosé from grapes sourced from Red Willow Vineyard in the Yakima Valley. Full disclosure, I was in the same wine production class as Michael Savage at the Northwest Wine Academy so I got to see the nascent beginnings of his winemaking career. He started his winery in 2011 with his very first release being a Cabernet Franc from the Columbia Valley. 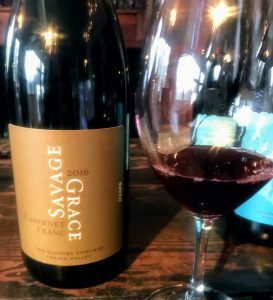 Inspired by the wines of Oregon producers J. Christopher and Cameron Winery, Savage makes his wines in a distinctly “Old World style”, using native fermentation and a light touch of oak. The wines rarely go above 13.5% alcohol with a yearly production around 2400 cases. The original 1985 Cabernet Franc plantings at Red Willow Vineyard. Paul Gregutt, in Washington Wines, notes that Washington State University planted the first experimental blocks of Cabernet Franc vines in the 1970s with Red Willow Vineyard following suit in 1985. From these Red Willow plantings, David Lake of Columbia Winery released the first varietal Washington Cabernet Franc in 1991. From the 1998 vintage, Kay Simon of Chinook Wines released the first varietal Cab Franc rosé that today has a cult-following among Washington wine lovers. Cabernet Franc is prized in Washington and Bordeaux for adding color, aroma and acidity to Cab and Merlot-based blends. Varietal wines are trademark by vibrant berry fruit that can range from red raspberry to blueberry. Wines often have floral aromatics (particularly violets), juicy acidity and savory nuances like freshly ground coffee, olive tapenade and forest floor. With oak, chocolate and tobacco spice can emerge. Cabernet Franc is valued in the vineyard for ripening earlier than Cabernet Sauvignon. It’s also more winter-hardy than Merlot. Despite this, acreage of the variety has been steadily dropping from a high point of 1157 acres in 2006 to 685 acres in 2017. Today, Cabernet Franc is the 4th most planted red grape in Washington behind Cabernet Sauvignon, Merlot & Syrah. Other producers making great Cabernet Franc include Sheridan Vineyard’s Boss Block, Convergence Zone Cellars’ Downburst, Camaraderie Cellars, Owen Roe’s Rosa Mystica, Hestia Cellars, Spring Valley Vineyards’ Katherine Corkrum, Gamache, Lagana Cellars and Cadence’s Bel Canto. Copeland Vineyard was planted in 2000 in the Rattlesnake Hills AVA of Yakima Valley. Owned by the Rawn brothers of Two Mountain Winery, the vineyard was converted from an orchard planted by their grandfather in 1951. Covering 26 acres on a sandy, rock strewn slope in the rain shadow of the Cascade Mountains, this warm-climate site averages 2980 degree days. In addition to Cabernet Franc, Copeland also produces Cabernet Sauvignon, Chardonnay, Lemberger, Merlot, Riesling, Syrah and the Portuguese grape variety Touriga Nacional. Two Blondes Vineyard was planted in 2000 by Chris Camarda of Andrew Will and Bill Fleckenstein. Located next door to Sheridan Vineyard, the name references the hair color of both men’s wives. A bit cooler than Copeland, the 30 acre vineyard averages around 2200 degree days. Chris Hoon, a 3rd generation farmer, manages the vines as well as those of neighboring Sheridan Vineyard. Beyond Cabernet Franc, Cabernet Sauvignon, Merlot and Malbec are also planted. The 2016 Copeland Cabernet Franc was sourced from the Rattlesnake Hills AVA with around 260 cases made. Savage aged the wine 6-7 months in neutral oak barrels. Inspired by the Loire Valley Cabernet Francs of Chinon, Saumur-Champigny and Bourgueil, this young Cab Franc has high intensity aromatics of raspberry and rhubarb pie as well as blue floral notes. There is also a little herbal aromatics that add complexity but not enough to describe it as green. On the palate, those raspberry and rhubarb notes come through and are heighten by the juicy, medium-plus acidity. The wine feels heavier in the mouth than what it 12.5% ABV would suggest with grippy but approachable medium-plus tannins. Some of the rhubarb “pie spice” notes come out on the palate like cinnamon and nutmeg. Long, mouthwatering finish. 2016 was the first release of the Two Blondes Vineyard Cabernet Franc and this wine couldn’t be more different than the Copeland. High intensity aromatics as well with similar blue floral notes but this wine uniquely has savory pink peppercorn spiciness and olive tapenade that gets your mouth watering before even taking a sip. There is also fruit in the bouquet but it’s more blueberry than raspberry. It doesn’t have the freshly ground coffee notes yet but I can see that emerging in this wine with more bottle age. On the palate that tapenade savoriness takes on a meaty element that would have me thinking in a blind tasting of a lighter style Côtes du Rhône until the minerally graphite pencil lead note emerged. The pink peppercorn spice carries through as well with the medium-plus acidity keeping the mouthwatering action going. The medium tannins are very soft for such a young wine and almost velvety. Like the Copeland, the Two Blondes Cab Franc has a long finish with the blueberry fruit lingering. Both the 2016 Savage Grace Copeland Cabernet Franc and 2016 Two Blondes Cabernet Franc are outstanding bottles. They exhibit very well two shades of this grape variety’s personality in Washington State. Very food friendly and approachable now, I can see these wines continuing to give pleasure over the next few years. At $28-32, they are both very solid wines for the price point. However, I would give the nod to the Two Blondes as being the most complex and layered. There is so much nuance and character in this wine that it’s worth getting multiple bottles to watch it develop. New posts sent to your email! Tagged Andrew Will, Bill Fleckenstein, Bordeaux blends, Bourgueil, Cabernet Franc, Cabernet Sauvignon, Cadence, Camaraderie Cellars, Cameron Winery, Chardonnay, Chinon, Chinook Wines, Chris Camarda, Chris Hoon, Columbia Valley, Columbia Winery, Convergence Zone Cellars, Copeland Vineyard, Côtes du Rhône, David Lake, Gamache Vineyards, Hestia Cellars, J. Christopher, Kay Simon, Lagana Cellars, Lemberger, Loire Valley, Malbec, Merlot, Michael Savage, Northwest Wine Academy, Owen Roe, Paul Gregutt, Rattlesnake Hills, Red Willow Vineyard, Riesling, Rosé Wine, Saumur-Champigny, Savage Grace, Sheridan Vineyards, Spring Valley Vineyards, Syrah, Touriga Nacional, Two Blondes Vineyard, Two Mountain Winery, Walla Walla, Washington Wines and Wineries, Yakima Valley. A few notes from the Walla Walla Valley Wine Alliance tasting featuring 40 different Walla Walla wineries at Seattle’s McCaw Hall. With over 900 wineries, even the most avid Washington wine lover has a hard time trying to taste them all. Walla Walla, alone, is home to around 120 wineries so even this tasting provided only a slice of what the AVA has to offer. My strategy at events like this is to hit several new wineries that I’ve never tasted before revisiting old favorites. 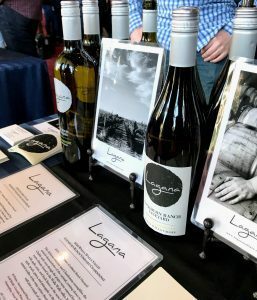 Lagana Cellars— Poured 2 whites (Sauvignon blanc and Chardonnay) and 2 reds (Syrah and Cabernet Franc) and while all 4 were solid, the reds were definitely a step above. The 2014 Minnick Hills Syrah was one of the few 2014 Syrahs that seemed to escape the reductiveness that (unfortunately) characterized several of their peers at this tasting and showed a beautiful mix of black fruit, mouthwatering acidity and spice. The 2015 Seven Hills Cabernet Franc demonstrated all the things that are beautiful about Washington Cabernet Franc (More on that below). It had vivacious, high intensity aromatics of violets and blackberry, medium-plus body with silky tannins. Kontos Cellars— Poured 3 reds (Cabernet Sauvignon, Malbec and blend) plus a bonus bottle blend named Beckett after the winemaker’s daughter. Founded by the sons of Cliff Kontos of Fort Walla Walla Cellars, the trademark seen throughout the Kontos wines was gorgeous aromatics and pitch perfect balance between oak, fruit, tannins and acidity. Even the two 2014 wines (Cab & Alatus blend) stood out but the star of the flight was the wine club member’s only release Beckett blend. 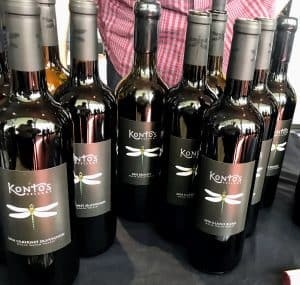 A blend of 61% Cabernet Sauvignon, 31% Merlot and 8% Syrah, the 2013 Beckett showcased Kontos’s high intensity aromatics with a mix of red and black cherries, red floral notes and lots of savory spice. I’m very glad that I didn’t miss this table. Tertulia Cellars— Poured 3 reds (Rhone blend, Syrah and Cabernet Franc). This is a little of a cheat since Tertulia is not really a newbie. Founded in 2005, I did try some of their early releases several years ago and wasn’t that impressed. I figured after nearly 10 years, I should give them another shot and boy am I glad I did. The 2013 Riviera Galets “The Great Schism” Rhone blend was outstanding. A blend of 50% Grenache, 40% Syrah, 7% Cinsault and 3% Mourvedre, this wine would do extremely well in a tasting of Châteauneuf-du-Pape. Beautiful savory, meaty nose but with enough rich dark fruit to clue you in that it was a New World wine. This wine also had one of the longest finishes of the night. The 2014 Whistling Hills Syrah had some of the 2014 reductive notes but it blew off fairly quickly with some air. The 2015 Cabernet Franc, like the Lagana above, was delicious. Other wineries that impressed me were Caprio Cellars (especially the 2015 Walla Walla Red), Solemn Cellars (especially the 2014 Pheasant Run Cabernet Sauvignon) and Vital Wines (especially the 2016 Rose). Despite enjoying their estate red for several years, I actually never knew that Figgins produced an estate Riesling and it was fantastic! From the 2016 vintage, the Riesling is decidedly on the dry side and had all the gorgeous white flower, apple and apricot notes that Washington Riesling is known for. Truly a top shelf Riesling that would go toe to toe with the best of Alsace and the Mosel. Anna Shafer of àMaurice continues to show why she is one of the best winemakers in the state working not only with her estate vineyards but also making a mouth-filling but elegant 2015 Boushey Vineyard Grenache and a 2016 Connor Lee Chardonnay that would tickle the taste buds of even the most ardent Meursault fan. The Bledsoe Family rose was also very tasty. Doubleback introduced their 2015 Flying B Cabernet Sauvignon. I got the first taste of a brand new bottle and I was highly impressed with how aromatic and flavorful it was for a pop and pour young Cab. While I enjoyed the regular flagship Doubleback Cabernet Sauvignon, I will say that for half the price the Flying B is giving it a run for the money. I would highly encourage folks to sit on the flagship Cab for 5-7 years from vintage date and drink the Flying B while it ages. While Washington State and Walla Walla wineries are known for fantastic Cabernet Sauvignon, Merlot, Syrah and Riesling, it was fun seeing winemakers embrace more obscure varieties like Albariño (Adamant Cellars), Grenache blanc (The Walls) and Carménère. 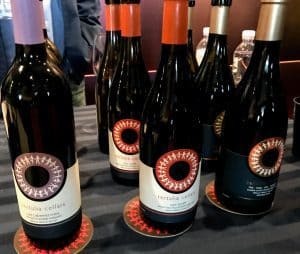 Paul Gregutt notes in Washington Wines and Wineries that the Figgins family of Leonetti were likely the first to plant Carménère in the state with cuttings they got from Guenoc Winery in California. Those cuttings were eventually shared with Colvin Vineyards that produced the first varietal Carménère in Washington in 2001. Since then the grape’s acreage in the state has expanded with plantings in Alder Ridge Vineyard, Minnick Hills, Morrison Lane and Seven Hills Vineyard. 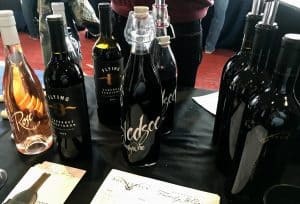 Among the numerous wineries featuring a Carménère at the tasting were Balboa/Beresan Winery, Drink Washington State (from Wahluke Slope), Reininger Winery and Skylite Cellars. I missed out on trying the Reininger but was fairly impressed with Drink Washington State’s offering. But admittedly at $26 you are paying for the uniqueness of the variety in Washington and, right now, it is hard to compete with some of the Carménère coming in from Chile that often delivers outstanding value under $15. Probably the geekiest wine at the tasting was Foundry Vineyards’ Stainless Steel Chardonnay from the Columbia Gorge. A Chard? Geeky? It is when it has 6% Maria Gomes blended in. Also known as Fernão Pires, Jancis Robinson notes in Wine Grapes that this obscure Portuguese grape variety is actually the most widely planted white grape in Portugal with over 41,500 acres. It is believed to have originated in either the Bairrada DOC or in the Tejo region but it can be found throughout the country including in the Douro. In the US, though, it is quite the rare bird. Walter Clore encouraged the first plantings of Cabernet Franc in the mid-1970s as part of Washington State University’s experimental blocks. In 1985, Red Willow Vineyard in Yakima planted the grape which was used by Master of Wine David Lake at Columbia Winery to produce the first varietal Cabernet Franc in 1991. Since then the grape has seen growth from 150 acres in 1993 to a peak of 1157 acres in 2006 only to decline to 685 acres by 2017. Which is a crying shame because of how absolutely delicious Washington Cabernet Franc is! 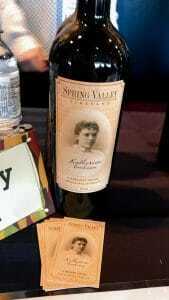 The 2012 Spring Valley Katherine Corkrum Cabernet Franc was, hands down, one of the best wines in the entire tasting. While Old World examples from places like Chinon and Saumur-Champigny in the Loire can be light to medium bodied and herbal with trademark pencil shaving notes, examples from Washington hold up to the weight and profile of the state’s best Cabernet Sauvignon and Merlot. Here Cabernet Franc can develop perfumed blue floral aromatics with some subtle fresh forest floor earthiness that add layers. The dark raspberry and blueberry carry a juicy edge due to the grape’s natural acidity. With some age, a very enticing fresh ground coffee note often comes out–something that the 2012 Spring Valley Vineyards Katherine Corkrum Cabernet Franc was starting to develop. Outside of Walla Walla, stellar examples of Washington Cabernet Franc include Chinook Wines, Barrister, Camaraderie, Matthews Cellars, Gamache Vineyards, Chatter Creek and Sheridan Vineyard’s Boss Block. Along with Woodward Canyon, Kontos produced the cleanest and best tasting 2014 reds I encountered at the tasting. 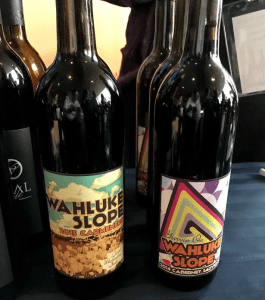 The most baffling aspect of the Walla Walla tasting was how many 2014 reds were disappointing. Despite widely being considered a very good year in Washington State and Walla Walla, in particular, several wines from even big name and highly acclaimed producers showed green pyrazine or reductive notes. One winery had massive volatile acidity (VA) issues with their 2014s. With many wineries also featuring 2013 and 2015 reds, sometimes even of the same wine as their 2014, the shortcomings in the 2014s stuck out like a sore thumb. And it wasn’t very consistent with one winery’s 2014s being green while another winery’s 2014 example of the same variety would instead have the closed aromas of reduced wines or (at worst with at least 2 examples) the burnt rubber aroma of mercaptans. While the reductive issues are minimized with getting some air into the wine (like with decanting), the green notes don’t go away. I can’t figure a reason why there would be so many green notes in what was a very warm vintage. As far as I can tell there were no reports of millerandage or coulure which can promote uneven ripeness and hidden green berries inside clusters of varieties like Grenache, Merlot and Malbec. Plus, it was the 2014 Cabernet Sauvignon and Syrahs that were more likely to show green notes. My only theory is that with it being such a large vintage perhaps some vineyards were over-cropped? But given the pedigree of the producers, I feel like that is unlikely. I honestly don’t know. As noted above, there were still 2014s that were drinking well (and I certainly didn’t get a chance to taste every single one that was being poured) so I encourage consumers not to avoid the vintage but be aware that there is some inconsistency. I’m just reporting on a trend that I observed during this one tasting event. The 2016 Figgins Estate Riesling was an absolute gem. Tagged Abeja, Adamant Cellars, Albariño, Alder Ridge, Alsace, àMaurice, Anna Shafer, Bairrada, Balboa Winery, Barrister, Beresan, Bledsoe Family, Boushey Vineyard, Cabernet Franc, Cabernet Sauvignon, Camaraderie, Caprio Cellars, Carménère, Chardonnay, Châteauneuf-du-Pape, Chatter Creek, Chilean wine, Chinon, Chinook Wines, Cinsault, Columbia Gorge, Columbia Winery, Colvin Vineyards, Connor Lee, coulure, David Lake, Doubleback, Douro, Drink Washington State, Fernão Pires, Figgins Estate, Fort Walla Walla Cellars, Foundry Vineyards, Gamache Vineyards, Grenache, Grenache blanc, Guenoc, Jancis Robinson, Kontos Cellars, Lagana Cellars, Leonetti, Loire Valley, Malbec, March Cellars, Maria Gomes, Master of Wine, Matthews Cellars, McCaw Hall, mercaptans, Merlot, Meursault, millerandage, Minnick Hills, Morrison Lane, Mosel, Mourvèdre, Paul Gregutt, Pheasant Run, Portuguese wine, pyrazine, Red Blends, Red Willow Vineyard, reductive wines, Reninger Winery, Riesling, Rosé Wine, Saumur-Champigny, Sauvignon blanc, Seven Hills, Sheridan Vineyards, Skylite Cellars, Solemn Cellars, Spring Valley Vineyards, Syrah, Tamarack Cellars, Tejo, Tertulia Cellars, The Walls, Tranche Cellars, Vital Wines, Wahluke Slope, Walla Walla, Walla Walla Valley Wine Alliance, Walla Walla Vintners, Walter Clore, Washington State University, Washington Wines and Wineries, Whistling Hills, Wine Grapes, Woodward Canyon.